Long sleeve cardigan: 31-51cm 100g, 56cm 200g. Short sleeve or sleeveless: 100g. Based on 100g balls baby DK. 22st/ 28 rows to 10cm, 4mm needles. 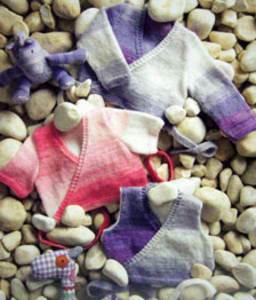 Suggested yarn - any baby DK, including self-patterning James Brett Baby Marble and Magi-knit, King Cole Splash, Peter Pan.